First (Commercially) Released: This video is currently not available in retail format. Marz was released as a performance video by Warner Bros. Records on 19 January 2015 (with an upload date of 16 January 2015) on their YouTube account, as premiered by the UK newspaper The Guardian. The video was produced by JPA Entertainment LLC, who also worked on the lyric video for Anotherlove. 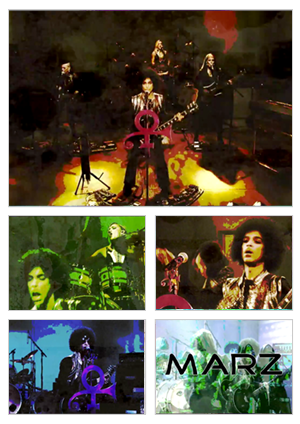 As with Anotherlove, the video contains footage from Prince & 3rdEyeGirl's Saturday Night Live performance on 1 November 2014, partially obscured by swirling clouds of ink and smoke in various colors. The audio is taken from the studio track. No other details are known about the making of the video and the level of involvement of Prince in this project. None as the video features footage from Prince and 3rdEyeGirl's Saturday Night Live performance. It is notable that The Guardian newspaper, who premiered the video, share a building with King's Place, where Prince and 3rdEyeGirl performed two impromptu shows on 14 February 2014. The newspaper gave Prince, and the shows, extremely positive press as a result. This page was last modified on 19 April 2018, at 19:20.